Periodontal disease, or gum disease, is a condition that can result from poor oral hygiene and infrequent visits to the dentist. If left untreated, it can cause serious dental problems, and can even require tooth extraction. To prevent periodontal disease from developing, you must practice excellent oral hygiene at home, and visit your dentist regularly for professional dental care. If you’re concerned that you’re suffering from periodontal disease in St. Louis , keep reading to learn about the signs and symptoms. 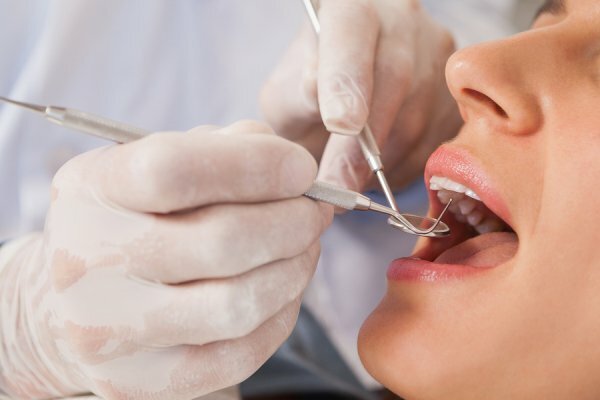 The first symptoms of gum disease can be tenderness, redness, and inflammation of the gums, but another sign is when the dentist measures your gums they find bleeding. This occurs due to poor oral hygiene. Brushing and flossing regularly removes harmful plaque and bacteria from your mouth. If you don’t practice good dental care, the plaque on your teeth hardens into tartar. Tartar harbors harmful bacteria that can cause painful infections in the gums. Once you have tartar buildup, it can only be removed by a visit to a dentist near you for a professional teeth cleaning. Be aware that pain isn’t always a sign of periodontal disease, which is why it’s important to see your dentist so he can look for bleeding when measuring your gums. If tartar is not removed, you may develop a condition called gingivitis. Gingivitis is a mild form of gum disease, and dentists consider it the precursor to full periodontal disease. If you have symptoms of gingivitis, such as bleeding gums, intensely bad breath, sores in your mouth, or pus between your gums and teeth, you should visit a dentist immediately. When caught early enough, a dentist can offer treatment that prevents gingivitis from progressing into gum disease. Gingivitis is also not always associated with pain, which is why it is important to have regular visits to the dentist. Don’t wait for something to hurt! In the final stages of gum disease, you’ll experience receding gums and tooth pain. As the infection in your gums spreads, it causes the gums to begin pulling away from your teeth, forming loose pockets. This may change the way your dentures fit, and can cause your natural teeth to lose proper support and structure. Without treatment, you’ll experience bone loss and tooth loss. A severe case of periodontal disease necessitates tooth extraction. Your dentist will then have to replace your missing teeth with dentures or dental implants. You feel you may be at risk for periodontal disease, come visit Dr. Spalitto at West County Dental!